As a mom, one of my biggest daily struggles is deciding what to feed the girls. I never want them to fall into the mac-n-cheese, chicken nuggets, pizza trap. I've always wanted them to be adventurous eaters. But eventually, I ran out of ideas. That's when I turned to my most knowledgeable friend, the Internet. I researched all sorts of cookbooks geared towards meal preparation for children. There's a plethora of them...it's big business these days. Armed with a list of about 25 books, I headed for Barnes and Noble. I can buy just about anything online, sight unseen, except for a cookbook. I need to see the book, look at the pictures and review the layout before I make a commitment to buying it. I found two fabulous books that have saved my life several times over. My favorite, Kitchen Playdates by Lauren Bank Deen, is filled with over 70 healthy recipes, menu ideas and activities that get kids involved in meal prep and cooking. 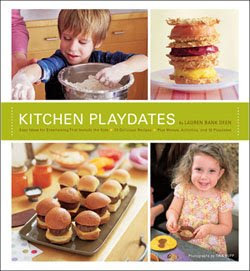 What I love most about this book is that it includes ideas for cooking style playdates. We've used the suggestions for several of Emma's playdates, and her friends have loved cooking and baking. What's even more surprising is to hear how so many of them don't do this type of thing at home. I LOVE to cook and bake with the girls. It's a great opportunity to teach math skills. The other book is The Toddler Café by Jennifer Carden. This book encourages parents and caregivers to make mealtime fun and interactive by getting kids to identify with their food. Carden suggests playing "food" games. As a result, we've devised a game called "The Ingredients Game". Whenever the girls are getting ready to sit down to a meal, we ask what types of ingredients were used to prepare the food that they are eating. An example is salsa. The answers are tomatoes, onions, peppers, cilantro, and salt. The Toddler Café also includes over 50 recipes that encourage families to cook and eat together. 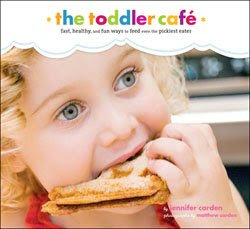 Jennifer Carden has a wonderful spin off blog, The Toddler Café which follows a similar format to the cookbook. Don't let mealtime mean madness. One or both of these books can put the spark back into your kitchen. Both books can be purchased at Chronicle Books and Barnes and Noble.